A great small travel and student guitar, it’s a real instrument shrunk down to travel scale. Something to keep you busy while at the beach or in the mountains. The Martin LX1 Little Martin Acoustic Guitar features a solid Sitka spruce soundboard atop the small, modified 0-14 body to guarantee tight, rich tone, volume and tone control on the Mini-Q pickup. Micarta fretboard and bridge, 23″ scale, Stratabond modified low-oval neck, and Martin’s patented mortise/tenon neck joint. Gotoh nickel tuners. it is really the acoustic dream, a work of art. Crystal clear highs come from a solid Sitka Spruce top while a body made of solid East Indian Rosewood projects loudly with a dark warmth, the traditional Martin bracing pattern generating fantastic tone. Equipped with gold Gotoh tuners with butterbean knobs. Features rich solid rosewood sides and 2-piece back. The finish is gloss nitrocellulose. The abalone and pearl work is absolutely gorgeous. The tuners are gold plated. Abalone hexagon inlays are used as position markers on the bound ebony fingerboard with more than 900 individual pieces of abalone into the bindings and inlays of the top, sides, back, and rosette. 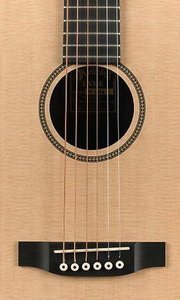 The Martin’s Dovetail Neck Joint insures optimum intonation and stability. 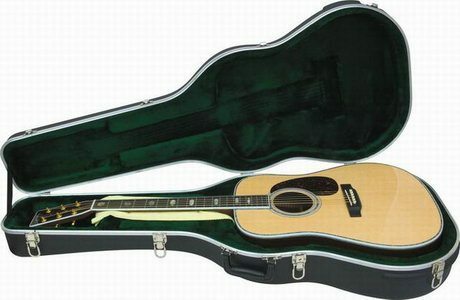 The D-45 Dreadnought guitar includes a deluxe Martin hardshell case. more on the bright side with loud trebles, great bottom end but not overly bassy. 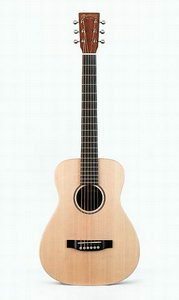 Quality-built with a solid spruce top, mahogany back and sides, Micarta fretboard and bridge, and hybrid D1 bracing. Features numerous deluxe appointments such as wood herringbone rosette, black binding, tortoise pickguard, chrome-enclosed tuners, and a natural gloss-top finish. Includes Martin hardshell case. Unless you want inlays,abalone,gold plated hardware,fancy BS you’ll be very happy with this guitar. Why waist money on ornamentation when it is sound and playability that really matter? big booming bass and well-balanced mid-range to treble tones. 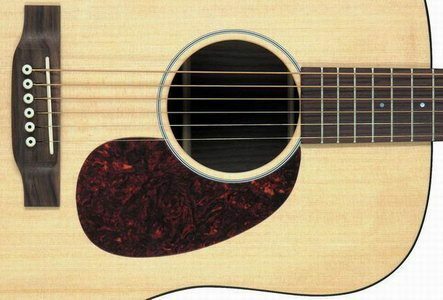 This acoustic guitar is all about tone. This Martin dreadnought marks the reintroduction of mahogany-top guitars to Martin s line. Body and neck constructed from genuine mahogany with a rosewood fretboard. The mahogany body and top is much lighter in weight than rosewood, koa, or maple and yields a surprisingly strong, warm sound with an emphasis on clear, bright, airy trebles. The Martin D-15 Dreadnought Acoustic Guitar is reminiscent of the 15 Series guitars of the 1940s. recommended for those who travel a lot. A braced, solid tonewood top with a solid mahogany neck, back, and sides gives this cool little guitar a surprisingly big projection. Built to withstand the rigors of camping, hiking, and off-road traveling. Includes high-quality chrome-enclosed tuners. A unique bridge on the nylon-string version accepts either plain or ball-end classic strings. Weighs less than 2-1/2 lbs. This is a travel guitar so you can leave your big and expensive ones at home. quite a perfect sound, definitely studio quality. Reminiscent of the 15 Series guitars of the 1940s – this model eschews vintage all-mahogany construction for a select solid Sitka spruce top and the ringing punch and sustain of solid East Indian rosewood back and sides. The D15 combines select woods and Martin quality in a tonally rich dreadnought! Since it offers a loud, bright treble response, genuine Mahogany was used for the top, back and sides. 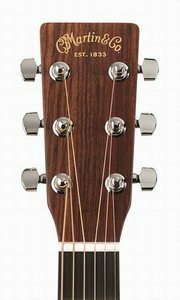 The modified low-oval mahogany neck is set with a mortise-and-tenon neck joint and has an adjustable truss rod and solid Indian rosewood fingerboard. The body and neck are bound in tortoise-colored binding. The Martin D-15 Custom Acoustic Guitar also has a rosewood bridge, dot fretboard inlays, rosewood headstock overlay, and an inlaid single-ring rosette. It looks quite simple, but expect a wolf in sheeps clothing. Only available through Musicansfriend. If you want all the Martin quality without the typical Martin price, this is it. If you want all the Martin quality without the typical Martin price, this is it. Crafted with a solid Sitka spruce top, solid mahogany back and sides, tortoise binding, modified low-oval mahogany neck with a mortise-and-tenon joint and adjustable truss rod, solid Indian rosewood fingerboard and bridge, and inlaid single-ring rosette. The mahogany body on this guitar is much lighter in weight than rosewood, koa, or maple and yields a surprisingly strong, loud sound with an emphasis on clear, bright, airy trebles.